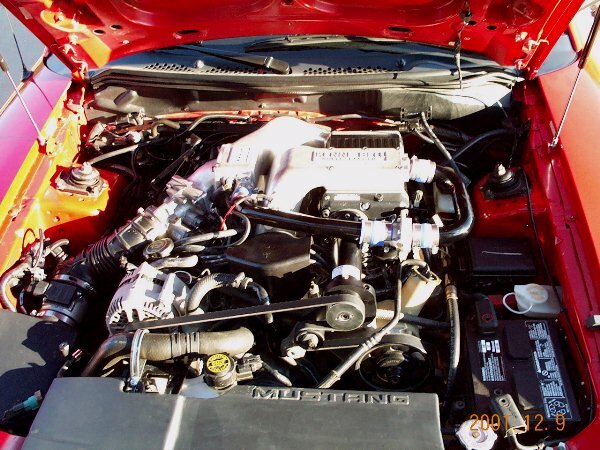 This 1995 Cobra Mustang is owned by Brian McFeeters. I recommended and installed the components below. 73mm C&L mass airflow sensor. Right now we have about the most conservative pullies on it and are only running 8psi boost. This is the dyno graph after all the work was performed. We tried water injection on it as well but it robbed about 30HP. We tried to adjust it to the minimum but still it was just robbing power. We ended up disconnecting at. We used about 1/4 degree to 1/2 degree boost retard per PSI boost to suppress detonation but we also ran 12 degrees base timing. The best run was 330HP at the wheels. The real story here is the power down low. It made 250HP at the wheels at just 3600rpm.